Download our 8-page Annual Review for 2009...and hopefully you'll be encouraged to see all that's been accomplished! Operation Write Home's revenue is made up of cash contributions plus the value of the cards donated. There's no accurate way to assess the value of the cards, since some would have a higher market value than others; we've assigned a median of $2 per card as the value for purposes of filing with the IRS. Expenses break down into three categories: fundraising, which includes the website; management and general, which includes things like professional fees, purchases of envelopes, etc; and programs, which includes the value of cards plus all our shipping costs. Our overhead rate is very very low; we currently pay no salaries, rent, etc, therefore almost all of your donation goes directly to shipping the cards. Text of the State of the Operation Message in the video above (approximate...getting the words close took almost 30 takes! Can't hire good talent nowadays...). The links will take you to blog posts or sites referred to in the message. Hi, I’m Sandy Allnock, president of Operation Write Home, here to bring you our State of the Operation message. We have so much to celebrate from 2009, and so much to look forward to in 2010! First, a thank you to our heroes watching this…you all are the reason OWH even exists. You’re the reason our nation stands strong and free—and we’re so grateful. Your courage, dedication, and willingness to sacrifice yourselves on our behalf are an inspiration and a blessing to us all. Keep safe out there, do your job well, write to your mom, and know we stand behind you 100%! 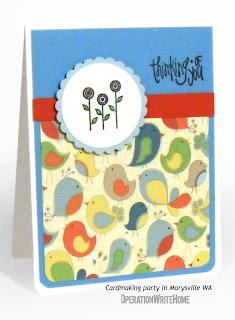 To our cardmakers…you make all of this possible with your amazing creativity! Our shippers are inspired by you, and our heroes regularly write to tell us how impressed they are by your handiwork. Thank you for giving of your time, your talents, and the treasures of supplies you use to make the cards! To our financial donors…how do we begin to thank you for being the engine that keeps us going! Your gifts, both large and small, make a difference in keeping the post office well-fed, keeping our website up and running, purchasing envelopes, and taking care of those behind-the-scenes tasks that are so necessary. And to all the companies who have donated supplies for our card challenge prizes, bless you for your generosity! Giant thanks go out to our shippers... who put in countless hours sorting shipping packing emailing and giving so much of their lives to this project. It wouldn't be possible without them and I am so very grateful for each of them who has served in 2009 and throughout the inception of the organization. 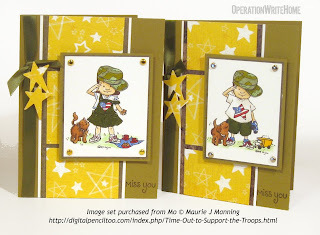 2009 saw so many changes for us—increases in card volume, the excitement of bloghops, new partnerships, hundreds and hundreds of new cardmakers addicted to serving our heroes—but the largest change was the name and website. After a long series of events, we changed from Cards for Heroes to Operation Write Home in September…and what a blessing that has been! Thank you to all those who helped us through that transition—especially our attorneys, and our board of directors, who slogged through IRS forms and Skype meetings to nail down the details! It’s amazing now that many people can’t remember what the old name was…only a few months later! 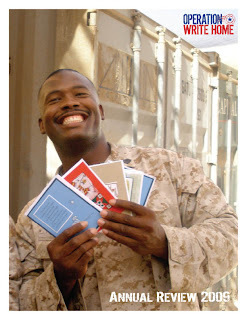 The number of cards received and then mailed out to our heroes has been astonishing – almost 240,00 in 2009, and 100,000 for Christmas alone! It’s no wonder our shippers were just a bit tired throughout the fall! But that brings me to another thing to celebrate: the number of people who have been stamping the backs of their cards, perfecting “the tuck”, including packing slips, and by doing these things, helping to make our shippers’ jobs easier! The extra few minutes you take on your end makes a world of difference on ours – thank you! We also saw a huge increase in Operation Write Home’s social media presence in 2009—first, among bloggers, as our bloghops took off with over 200 blogs participating throughout the year, and then on Facebook and Twitter. Our Facebook fan page has been an incredible resource for all of us to get inspired, learn tips and tricks, see pictures of each others’ cards, and become more of an OWH family as we get to know each other. Our new Stars and Stamps blog just began this month, and stems from of all the crafters who want to really develop our community and encourage each other — and that’s what social media is all about! Friends! The more that the blogs and facebook fans comment, post, link, and generally chatter about, the higher our rankings on Google, Twitter, and Facebook, and the more free advertising we get from them all— which all leads to inviting even more crafters to join us on our mission. It’s a win win all around! As we get further into 2010 and find more of our service members leaving Iraq, our focus on Afghanistan will become even more prominent. 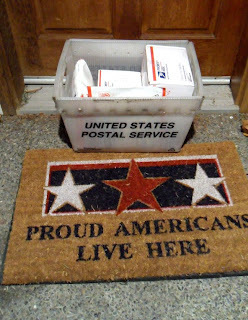 We’ll be working on making more connections with those deploying to Afghanistan, and may find ourselves moving some of our deadlines earlier to accommodate longer shipping time for our boxes, so stay tuned to the Homefront Blog as that begins to develop. The heavy deployments to Afghanistan may also mean we need even more cards; many locations there don’t have internet access, unlike Iraq where it was much more common. 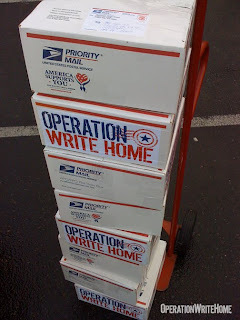 Therefore writing letters could be an even more urgent needs for those deployed. This year we’re working on more back-end database details to smooth out our processes, complete with automated receipts! You have no idea what a blessing that will be. We’ll also be moving further on the process to register our trademark for our name, Operation Write Home, and fundraising for the fees that process will incur. I’ll stop talking and let you read the Annual Review pdf itself; for those watching this on YouTube, look over there for a link, and on our blog, scroll down to check it out, as well as to see a transcript of this video complete with links to things I mentioned. I’d like to close with a letter that just came in yesterday..."I was thrilled to find a box of cards from my FAVORITE support group in the pile of my packages. I can't even begin to tell you how much joy (and envy) your cards have brought to my family and friends. Our deployment is ending soon, and I will certainly miss the men and women I have served with here. 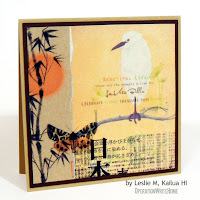 But I will also miss the gorgeous boxes of cards and think of your grou pevery time I buy a card in the future! Thank you for all your efforts and kindness. Much love, LCDR K. R."
God bless our OWH family. and God bless the United States of America! Over the next few weeks, we'll be posting a little more detail on some of the items included in the Annual Review....especially anything that would answer questions from all of you. Stay tuned to this blog and we'll share more info! This week we received 4,467 cards...thanks SO much, everyone! CDR Booth! You are so wonderfully generous, thank you! 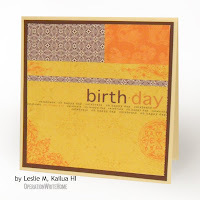 Joscie C, Honolulu HI, your cards are just so CUTE! Thank you so much!! 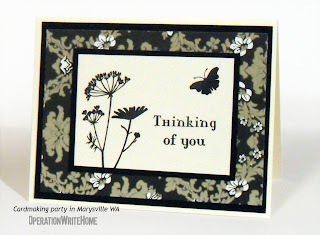 Patti S, St Louis MO - beautiful cards, what a nice selection of themes - thank you! Thank you, Kathy W. of Scrapin' Kats Scrapbooking in Cullman, AL. The cards you sent are delightful. Please pass our thanks to the girl scouts! Thanks too for the donation. The cards and pictures from the seniors to our heroes are lovely! Melinda B, Tulare CA - awesome box of cards, thanks so very much! 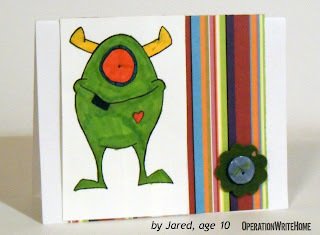 Katherine F. of Bel Air, MD, thank you for your beautiful cards for our heroes! You do lovely work. Thanks too for tucking the the back flap in the envies! Wow! Thank you Elaine H. of Keene, RI!! 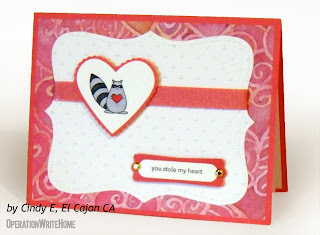 Your Valentine/Hero notes are beautiful, and they will surely bring smiles to the recipients. Loved your picture selection! Brandi Z. of Bristow, VA, thank you for the large collection of cards, your note to a hero, and generous donation. You do lovely work. 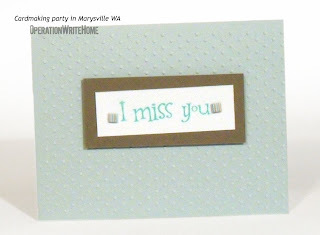 My favorite was the dog tag "i miss u" cards. Clever! Thank you Jeanne B of Glenview, IL, thank you and the 3rd Grade Art Club at Winlelman School for the beautiful selection of cards and the many hero notes. Well done! Paula E. in Virginia Beach, thank you for all the cards! I must say, you sent some fun cards! Love the hats for St. Patrick's Day! Thanks too for the generous donation! Thank you Lisa H. in Hopedale, MA! Your third graders did a super job making cards for our heroes and writing letters to them as well. These will bring a lot of smiles to our heroes and their families. Well done! Thank you Marge M. of Wayne, NJ for your beautiful cards for our heroes. They're so bright and happy. Just what we need for spring! Lori R in Springfield, VA, thank you for the cards for our heroes to send to their families! I especially loved the "Friends" cards. Your talent will bring many smiles! Michelle S. in Bucyrus, OH, thank you for your cards and Hero letter! I LOVE the St. Patricks cards! 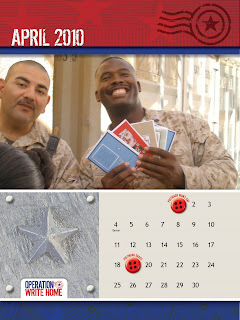 Your cards will be appreciated by our heroes and their families! Lina W, Hampton VA - thanks for the cards....here's hoping your creative block passes quickly! 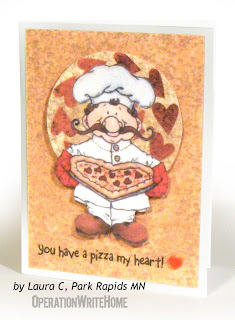 SuzAnn H, Salt Lake City UT - thanks for the wonderful selection, these are fantastic cards! Thank you, Salina K. in Cary, NC. Your cards are delightful! Such a nice collection of colors, sentiments, and techniques. Thanks for sharing your talent! Becky N, Elk Grove CA, thanks for the AWEsome AnyHero letters from your students!! Many thanks to the Women's Missionary Union of the Union Level Baptist Church in South Hill, VA!! 974 cards! That's a lot of happiness for our heroes and their families and friends! Christine W, Bothell WA, your cards are wonderful, our heroes will really enjoy writing home on them! Your financial donation means so much as well, thanks!! Arkport UMC - thanks so much for the wonderful cards!! Sue A, Rockford IL....WOW! Two packages in one week.....gorgeous as usual. Thanks so much!! Barbara B. in Center Valley, PA, thank you for the lovely cards! They're my favorite color combination! Yummy! Thanks for the generous donation too! Cindy B, Dearborn Heights MI....Love these Easter cards. Thanks for sending them in early!! Diane B, Forney TX, your cards are so cute!!! Thanks for the donation too! Leah C, St Paul MN.....another great box of cards! Love your style!! Kay C, Minnetonka MN.....thank you for the beautiful cards and for so many different themes. Many thanks to the ladies at Scrapbooks & Etc. in Harrisburg, NC! Thanks for the cards, the treats for troops, and helping the east coast shipper. You all rock! Karolyne D, Houlton WI....Love that every card in the box has BLING on it!!! Katherine D and Women's Bible Study, Tallmadge OH.....ladies thank you for these beautiful cards!! Rhonda G and Southern Hills Christian Church Women's Group, Edmond OK......thank you so much ladies for the awesome box of cards! Ginny H in Calabash, NC, thank you for the terrific cards! 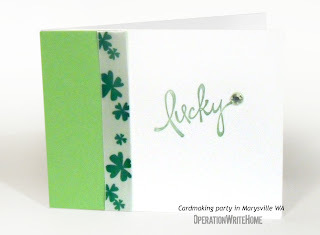 Beautiful St. Patricks cards! Such a nice variety! Karen H, Monticello MN.....FABULOUS!!! WOW these cards are great. THANKS! 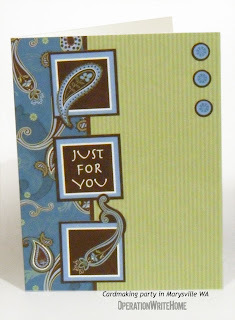 Sherry J, Minnetonka MN....an awesome box of cards. Appreciate that there are lots of different themes. Esther & Eileen J, El Paso TX......thank you ladies for these beautiful cards and Any Hero letters!! Nancy M, Fremont CA - your cards are always so wonderful, thank you so much!! Cindy M, Normal IL....WOW! What a box of awesome cards! Thank you. Medeiros & Marote Family, New Bedford MA.....thank you for the great cards and Any Hero letters!!! Kelly M, Redwood City CA, these are sooooo cute! Love the stencil painting - thank you! Thanks Dawn M and Debbie T. in Charlotte, NC for the terrific cards. You two always make beautiful cards for our heroes! Thanks! Jennifer M, Marshfield WI....Thanks so much for these gorgeous cards! Love them!! Rebecca N, Kankakee IL...WOW! A box of gorgeous cards and lots of them. Thank you! Lori N, Jefferson City MO.....fabulous cards! Thanks for your continued support. Mary P, Little Falls MN....thank you for the beautiful cards! 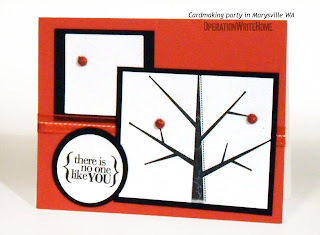 Michelle R, Aurora IL.....love your layouts and colors. Beautiful cards!! Thanks! Mary S in Camden, NY...Wow! What a neat collection of cards and techniques! Thanks for the cards, the donation, and the treats for our heroes! Deloris T and Linda and Anne, West Salem OH......ladies, thank you for the beautiful cards!!! Much appreciated. Claybon Elementary School first graders, Forney TX - love your valentines, and our heroes will too. Thank you! An extra snippet of gratitude—that the card hospital cards in WA pictured here have finally been "triaged"! To keep your cards out of the hospital—and save our shippers hours of labor on them—1) be sure that any you make using dark cardstock have light colored liners in them, since our heroes don't have white pens; 2) be certain to use good adhesive so googlie eyes and ribbons stay where you put them; 3) add cardfronts to cardstock. We're happy to do this work as we have time, but sometimes it means cards will sit for a long time in a box waiting for some TLC....and some of the ones in this pile missed this Valentine's Day, so will still be waiting for 2011. 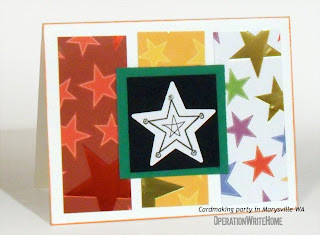 What are your tips for mass producing cards, especially at a cardmaking party? 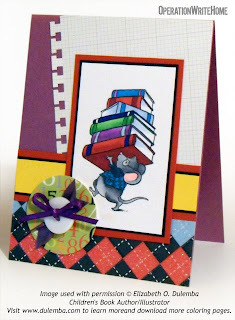 Do you create extra-easy designs for novice cardmakers? Sample techniques for everyone to try? Please consider sharing your knowledge. Are you an expert at a technique? Are you a stickler for testing and reviewing products like inks or adhesives? 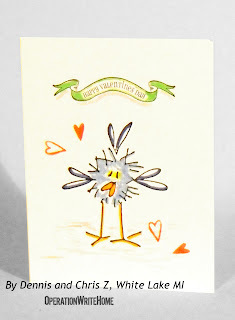 Do you enjoy creating sketches for others to use for their cardmaking? Even if you're not a blogger, you just may have information you'd like to share, and we'd love your help! Go visit the blog, sign up to receive email updates if you want...and join in the fun! 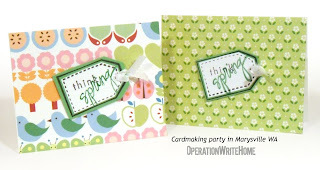 Posts about the cards themselves will now show up on the S&S blog—thus keeping all the crafty inspirational posts over there, and nuts-and-bolts business over here on the Homefront Blog. If there's any news of utmost importance for everyone to see, THIS is the blog where it will show up (or we'll link over to the other location), so if you'd like to limit what you want to visit, you're in the right place! 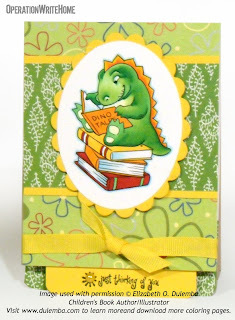 Bloggers: Check the blog roll we've begun, and be sure to go visit your fellow OWH cardmakers! Share some warm fuzzies...you know how we all enjoy feedback on our work! Non-bloggers: If you'd still like to participate in our challenges, you can post your photos on a photo site, on our facebook fan page, or elsewhere—just leave a link on the challenge post! And of course everyone is welcome to visit our OWH bloggers and leave them feedback! **NOTE! ** One of our heroes posted a bunch of awesome photos on our Facebook Fan Page! Even if you don't have a Facebook account, go check them out and SMILE! We're reporting on 6749 cards this week...many were mailed out from Massachusetts a few weeks ago as the final cards from there, but only now showing up in our listings. Our shippers are needing to get more boxes out soon, so are awaiting lots of your cards in the mail! 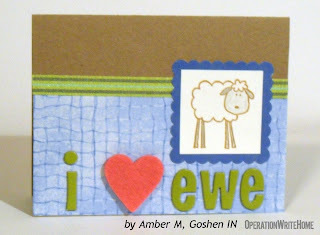 Cardmaker Kathy S is very observant—she found a major error on our OWH Calendar! The Mother's Day deadline was accidentally placed on the 14th of April rather than the 1st. The 14th is our last day to get the boxes to the Post Office, not the last day to mail Mother's Day cards to us...!! Please either re-download the full pdf and reprint page 5, download page 5 only, or mark the printout you've already made to reflect the accurate date. And while we've got your attention on deadlines - please try to aim for a week or two before each of the posted deadlines. Those dates are for the last-minute Charlies....we start shipping boxes with holiday cards about 7 weeks prior to the holiday itself, sometimes more - and need holiday cards much earlier than that. Plus, the last-minute rush means our shippers get little sleep during the final week - so if you're an OWH 'regular', you can help your shipper a lot by getting your holiday cards in much earlier. 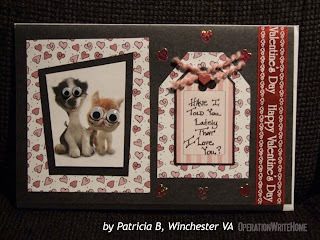 Oooh and I just remembered a note from one shipper - she found some Valentines that only said Happy Valentines Day on the inside.....so especially if you send cards during that last week or two, be sure to call out the section of holiday cards so they don't get missed. 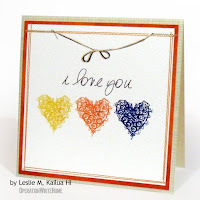 This is unrelated to OWH...but we know our cardmakers have big hearts! Here's a call for cards that was posted on Facebook; take a moment and send a cheery card to this young lady! Below is a description of what she's going through; the update just sent to the Facebook Group last night said she's in an induced coma right now, and asked for prayer for her sisters Haley (11) and Taylor (almost 10) too as they continue watching their sister go through this; if you want to send three cards, I'm sure Haley and Taylor would smile as well! Amber Dougherty is a 13 year old from Tyrone, PA and is suffering from Severe Intractable Epilepsy, with a sadly grim prognosis. According to an email sent by a family member, the doctors don't expect for her to be with us next Christmas. Since Amber likes to receive mail, her family is organizing a card drive so that Amber can get mail from all over. She also has a more informative webpage at http://prayernet.geisinger.org Her case is labeled damo56. Join their Facebook Group if you'd like more info on Amber's progress, or would like to donate to help the family financially. About Leslie: I’m married with two grown sons and I live in paradise. How long have you been making cards? I’ve been making cards and calendars for friends and family for a few years. I gradually evolved from hand stamped cards to hybrid/digital cards once I finally made the leap to photo editing software. How long making them for our heroes? I just completed my first year of making cards for heroes through OWH! How did you find out about OWH? I stumbled upon OWH’s website and thought it was a great volunteer effort to get involved in. Growing up in a Navy family, I knew how special it was to get a handwritten card from my Dad when he was overseas. It’s been a lot of fun and very gratifying to be a part of OWH. It’s exciting to see how quickly the project has grown and all the good work Sandy and Team are doing with the website. What’s your favorite kind of card to make? 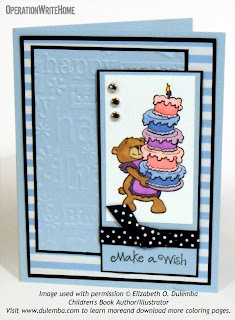 I make all kinds of cards – I usually keep to basic themes that can be used for different occasions. I’m always on the lookout for new ideas and inspiration. For some reason, I’m hooked on making square cards, so it’s a good thing that our heroes don’t have to pay postage when sending cards home. Do you have a special technique you love to use? I use Photoshop to organize and layout the design. Then I print out the card front and layer it onto nice background paper to make it pop. I’m a paper addict and love nice heavyweight textured paper for printing the card front and background papers. Colors, style, or product that draw you? With digital cards, the sky’s the limit. 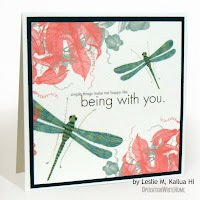 There are so many kits, papers, embellishments and other images to choose from. By working digitally, you can create the exact color combinations you want – experiment til you get the layout right or toss out what doesn’t work and start over – all before printing anything out. What motivates you to make cards for heroes? It’s gratifying to be able to contribute something that helps bring our troops and their families closer together. Although email is the easiest way to stay in touch, it just doesn’t come close to being able to hold onto a card from that special someone. An additional note: We do request that donors sending square cards include envelopes for them as Leslie does; OWH has limited funds for purchasing envelopes, and square ones are pricey! Geri A, Mercer Island; Marianne B, Issaquah; Joyce A, Bellevue, and Sharlene C, Bellevue -- way to go ladies! What a fantastic batch of cards! Lina W, Hampton VA - thanks so much for your awesome cards...they're soooo cheery! Pam R. in Milford, CT, thank you for the cards and the generous donation. 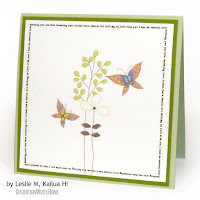 I loved the "Howdy" cards and the 3d butterfly! Just lovely! Bridget N, of Jacksonville, FL, thank you for the cards and the generous donation! Loved the ribbon cards especially! So clever! 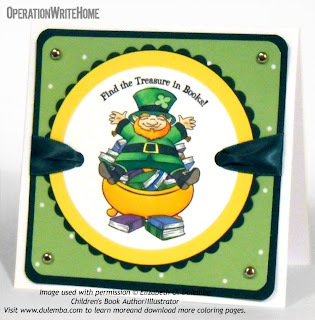 Lisa S. in Jacksonville, FL, what lovely green cards for St Patrick's Day greetings! You'll be a hit with our heroes! Thank you for the donation too! Thank you, Dolores A. in Frederick, MD for the variety of cards you sent! They're just terrific, as are the letters to our heroes. Thanks too for the lovely letter you sent to this shipper! You touched my heart! Hickory Ridge High School Beta Club in Harrisburg, NC, THANK YOU for the 55 notes you wrote to our military heroes! Thanks too for the generous donation! You ALL did a terrific job! Well done! Thanks to the Student Council at C. C. Griffin Middle School in Concord, NC for their letters to heroes! What a great job you did! The messages and artwork is terrific! Michele L. in NYC, thank you for you first donation of cards. They're terrific! You'll bring a lot of joy to our heroes and their families! Well done! Kathay P, Humble TX - your faithful giving is such a huge blessing....thank you! 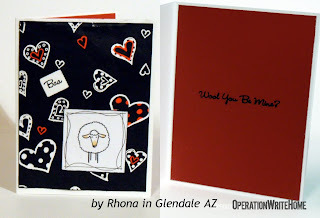 Denise W, Las Vegas NV, such beautiful cards as always - thank you! Lillian R, Lady Lake FL - we're blessed by your donation...so glad to hear you got one of our cards! Josh P and family of Livingston, NJ, thank you for the beautifully written Any Hero letters. You're so thoughtful. Cristy D in Charleston, WV, thank you for the fabulous cards! I love the blue, green, and brown combination! Yummy! Kathy P. in White Lake, MI, thank you for this first batch of beautiful cards and the Hero letter! Love all the embellishments! Thanks too for sorting them by event! Thank you Community Service Club at West Rocks Middle School in Norwalk, CT!! This collection of letters for our heroes will bring smiles to their faces. Well done!! Thank you ladies at Scrapbooks & Etc. in Harrisburg, NC! Great collection of cards to fill the shipper's stash! Rock on!! Though sometimes called "clip art," that term does digistamps a great disservice. 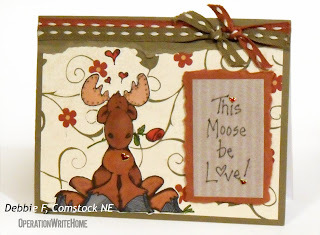 Clip art in many cases is the cheesy art available in Word — but digital stamps can be quite elegant! 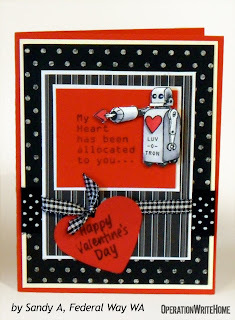 All the stamps used in the cards shown on this post are digital stamps...you won't find a single one of them in Word! Artists of all styles are making digital stamps nowadays, and they're worth a look, even if you love your ink and rubber. Digital stamps are most often sold on Etsy or on a stamp artist's blog, and occasionally in online stores as well; many digiartists give away occasional freebies, to try to tempt us into trying them out! These are digital files, so once purchased, they're downloaded to your computer, and you can print them again and again to make more cards. A few benefits of digital stamps: the price is right—they're typically a lot less expensive than rubber or acrylic, require no shipping charges, and they take up no shelf or drawer space! And one digital stamp can be resized to suit your layout, large or small! A little bit about digifiles: You'll most often be given a link to a jpg that will look LARGE in your internet browser. That is because the files are either very big at 72dpi, or a smaller size but a higher resolution. The internet requires renders images at 72dpi—but if you print out a card-sized 72dpi jpg, you'll get a really blurry image. (If you download a thumbnail image, it will be really blurry when printed; be sure you're downloading the largest image available.) The image you download should show up in Word or other software at a reasonable size, even if it looks huge in IE or Firefox. An important note: PLEASE read up on the Angel Policy for any digital stamp designer whose work you're using, whether purchased or free. 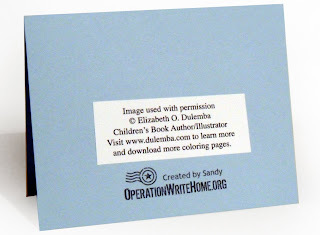 Some require © information to be printed on the back of the card with their information and url on it; OWH requests that all cards donated honor those policies! 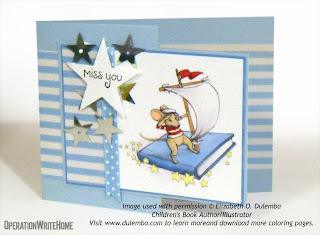 Cardmaker Linda L emailed with a link to Elizabeth Dulemba's site—she's a children's illustrator and since I'm one as well, I was thrilled to connect with Elizabeth and feature her art here. (Check out her books, they're awesome!) She's allowing us to use her illustrations for cards for OWH for free! How awesome is that. 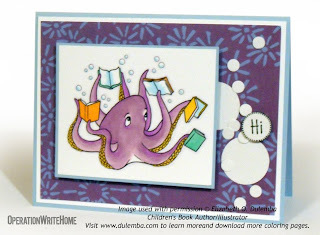 She has a lot of great images for kids cards—many are drawings to inspire them to read! I can't tell you how many of these images I've downloaded and started coloring! (Copics, look out, here we come!) Here are a bunch of cards made with them....what's your favorite? Elizabeth very specifically asks that we include information on the backs of our cards directing people to her site; I printed the information and adhered it to the backs of mine. and download more coloring pages. Now it's your turn! Go to one of the digi sites and download an image—and make a card with it. Come back here and leave us a link so we can all go visit! 9,784 cards were mailed this week...10 were the first going out of North Carolina! (Go Dixie go!) These boxes included the last of all the Valentines that arrived on time. We have a few hundred Valentines that came in very late (mailed past the deadline), as well as some that "hid" from us....our shippers were pulling out any Valentines from boxes they didn't have time to complete sorting, and found some love cards with "Happy Valentines Day" stamped inside. So those will all wait for Valentine's Day 2011! You might consider finding a way to call out your holiday-specific cards when you mail them, just to be sure they don't also end up as stragglers that have to wait a year! 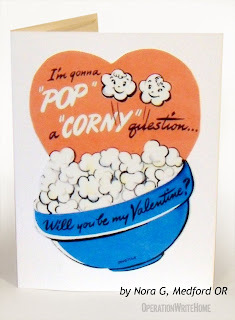 On our Facebook Fan Page, we've been collecting some mighty funny valentines....here's a dozen to make you smile! And if you've got a funny one to share, leave a link in a comment so we can check it out too. Happy New Year from Iraq!